Many people think the electronic controller as used on anti-icer/de-icer sprayers will achieve calibration by itself. The truth is that the controller has all the necessary information and programs to operate the sprayer. When the pressurized liquid hits the nozzles, the problems begin. Unless the nozzles can adjust themselves like the controller adjusts itself, it’s impossible to spray the correct rate for the wide range of speeds. At slow speed, up to 15 MPH, the fixed orifice nozzle hole is too big for the low flow called out by the controller. So the nozzle can’t hold its spray pattern.If the ground speed override feature of the controller is on, the slower the sprayer goes, the more is applied per lane mile. This is the opposite of what the specs call for. 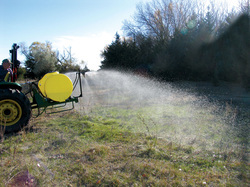 At high speed, to go from 1 to 60 MPH is a 6000 percent increase in spray rates required. No fixed orifice nozzle has the capability to accommodate this large a change. Without the new Variable Orifice O-Nozzles, it’s impossible to get good results. With them, snow and ice melting will improve, you will re-spray less, your operating costs will be lower and accident rates will be reduced.